Search Results for "aged care"
Attractive mature blond haired female enjoying her skincare routine, using cotton pad on her shoulder, posing on green chromakey background. Maturity, anti-aging care concept. Chrysanthemum falling from hands, slow motion. Aged woman hands with classic red manicure receiving spa therapy in beauty salon. Skin and hands care. Senior woman receiving manicure in nail salon. Female cosmetician filing nails with files to aged woman in nail studio. Skin and nail care. Red gerbera in elderly woman hands. Well-groomed hands of aged woman with perfect red manicure touching beautiful red gerbera flower. Delicacy and care. Close up of cosmetologist smear cream on adult woman face in beauty saloon. Anti aging care. Cosmetic procedure. Aged Woman record video blog about domestic animals. She is uses special care oil at her dog. Animal blogger. 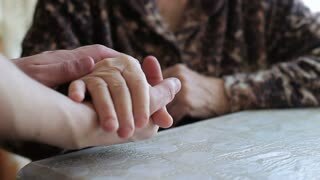 An aged, senior female patient in a health care setting has her hand held by a younger man in comfort, love and care. ProRes file, shot in 4K UHD.